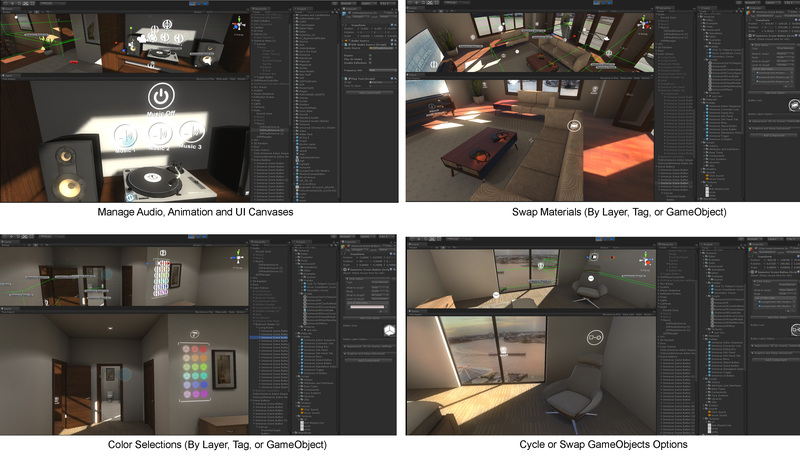 Today we’re excited to introduce the Immerse Framework, a toolkit of building blocks for creating interactive and multi-user virtual environments with the Unity game engine. New users can quickly bring their projects to life without writing a single line of code, while advanced users can take advantage of our improved input handling, Actions, and fully programmable API. With Immerse, we’ve put some of the best minds in Unity to work improving what you can do with Unity and solving common problems that all projects face. You can use our expertise to save potentially thousands of dollars and months of time that would otherwise be spent building these same elements from scratch. Within minutes, you can easily drag and drop prefab Interactive Elements into your scene, then choose from a variety of available Action Elements. Finally, you can decide which of the Immerse Navigation systems you want to use to make it easy for users to find their way around your environment. Everything is well documented, customizable, and designed to work with your other existing tools and assets. Immerse isn’t a system that replaces what you’re already doing – it augments it with new tools and building blocks. With Immerse you can add interactivity to your project, introduce actions that bring your scenes to life, and quick and easy add navigation options for users. First, you set up the elements in your scene users will interact with, and select from a variety of methods for them to interact. 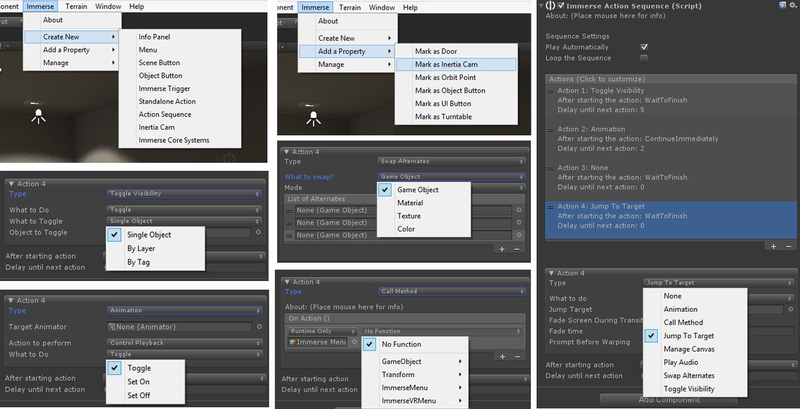 For example, you can set up a Main Menu, Scene Buttons, Trigger Zones, and turn any object in your scene into a button. They can click with a mouse or XBox controller, or in VR mode they can use their gaze to interact with the scene. With your interactive elements established, now you can load them up with Immerse Actions that bring the scene to life. 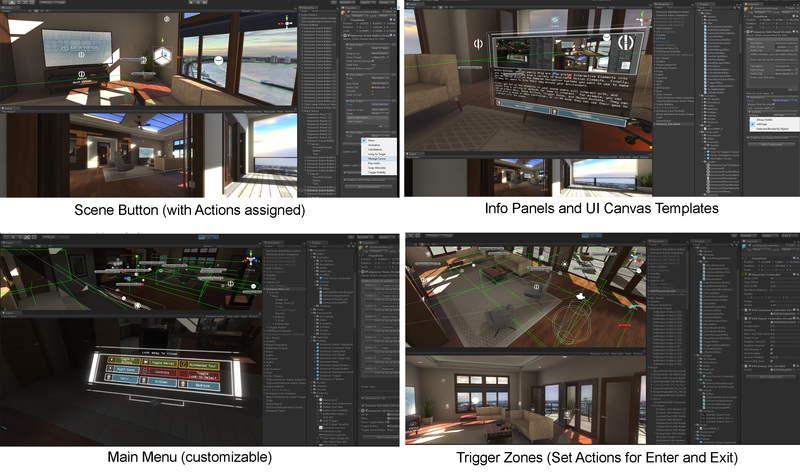 A few examples of Immerse Actions include the ability to turn lights or layers of content on or off, manage audio, manage animation, swap materials or colors, managing animations, and more. Finally, Immerse provides a variety of navigation options that enable users to explore your environment in an easy and intuitive way. Navigation options include: Warp (jumping to another position in a scene), Look to Teleport, Jump to Scene, Comfort Mode, Orbit Cam, Automated / Guided Tour, Dollhouse View and more. Immerse Framework was designed from the beginning to work with VR, but it can also be used to create non-VR applications that can run on any PC and soon directly embedded in web browsers. 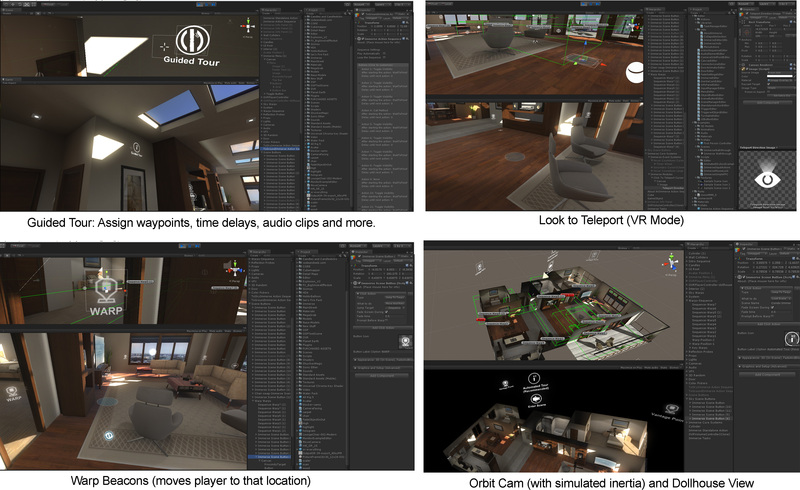 Best of all, your applications built with Immerse can easily be toggled between VR and non-VR versions, and all of your UI and interactions will work both places. 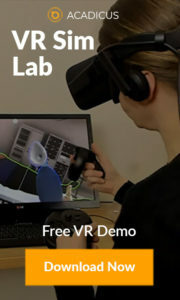 We’ve also developed a multi-player platform called Immerse Collaborative for both VR and non-VR applications, that integrates seamlessly with the Immerse Framework. Immerse Multi-User is a white label solution designed to provide a secure, private multi-user resource for your project. We’re also developing a library of triple-A quality 3D assets, prepared specifically around Unity’s PBR (or physically-based rendering) system to achieve the greatest realism. While the Unity Asset Store has many fantasy or sci-fi assets, everyday items and those specific to medicine, technology, and other fields are hard to come by. Luckily, we have in-house talent and expertise in creating 3D models for a variety of fields. While Immerse will likely work fine in a wide range of platforms, we have currently tested and confirmed compatibility with PC standalone and Oculus Rift DK2 (SDK 0.6.0) with Unity 5.